You want to realize your graphic concept in a professional way that enhances your company image and produces results. And you want it rapidly, efficiently and at reasonable cost. EKZE is your answer. 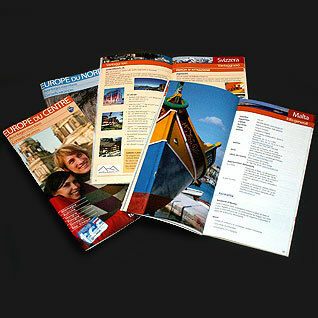 EKZE desktop publishing services, in Carouge, Geneva, offers a full range of quality graphic services for your project. Or, optionally, you may select any one or more of our production services to suit your needs. A team of specialists in concept design and realization, we at EKZE dedicate our experience and know-how to your total satisfaction. This includes control of every step in the production process, from desktop to printing, to ensure the finest quality.